All the live, detailed updates from the final day of the second Test between England and India. Time for the post-lunch session to begin. Matt Prior strides out. Can he play a Jadeja-like innings? Can he score some quick runs and take the pressure off England? Eng 173-5 after 76 overs. Target 319. First over after lunch, 10 runs. Two magnificent pulls for four by Root. He looks like he never had a break. England 183-5 after 77 overs. They need another 136 runs with 5 wickets remaining. Another four. Prior helps himself to a short, wide one from Ishant. Eng 187-5. They need 132 more to win. Short and away. Ishant bowls another short ball, Prior goes for his shot, picks out the gap. The runs are flowing and England need 126 runs now. Eng 193-5. 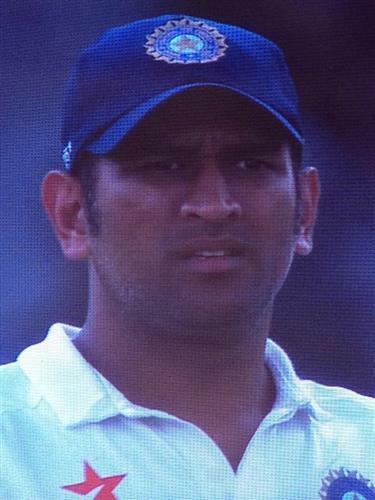 20 runs in 2 overs and Dhoni turns to spin. The new ball will be a risk that Dhoni has to take. Dravid: "You gotta take the new ball, you gotta take wickets to win the match." Crucial partnership...three southpaws in the last four and that's when the rough will come into the equation. New ball must fetch a wicket. Atherton in the TV Comms says, "This might be the end of a rather significant England career." Ben Stokes walks in. He hasn't scored a run in the series. The new ball is now due. Ben Stokes: last 9 innings for England in all formats: 18 runs (ave 2.00), HS: 5; also includes 5 ducks! Ben Stoke in the middle and he has four close-in fielders around him. Nervous times for him. Eng 199-6. WICKET! Ben Stokes is gone... again. His series so far: 0,0,0. Short ball does the trick again. Mis-timed pull, easily caught by Pujara. Ishant has 5-64. Eng 201-7. Ben Stokes: last 10 innings for England in all formats: 18 runs (ave 1.80), HS: 5; also includes 6 ducks! Wonder what Root must be thinking... he has played sensibly... the others are just giving it away... Eng 201-7. India need 3 wickets to win.